The Model 2450e uses LonWorks® Technology that is the latest in microprocessor capability, giving the user the highest level of application flexibility. A large illuminated graphics screen, multiple inputs and very easy setup with easy field upgrades characterize this new technology. Water meters and sensors are purchased separately. Uses 2-electrode or 4-electrode conductivity sensors. process connection. pH input can also be configurable for an ORP sensor. .RS232 output for remote monitoring, control and data acquisition (-RS2L). 4-20 mA output for (-35L, select any four, two per –35L card)pH, conductivity, temperature, concentrate flow, permeate flow, percent recovery. 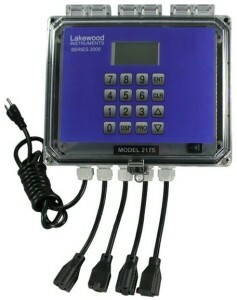 2450e LONWORKS Technology-based Reverse Osmosis Monitor including the Real Time Clock. Sensors and water meters are ordered separately. -35L Two channels of 4-20 mA outputs. -35L2 Two additional channels of 4-20mA outputs for a total of four 4-20 mA outputs. The 35L must be installed before adding this option. -RS2L Communications node with the LRWS program. 1TM-NPT 1 inch turbine water meter with stainless steel pipe thread adapters. 1TM-ESW 1 inch turbine water meter with PVC solvent weld adapters. 2TM-NPT 2 inch turbine water meter with stainless steel pipe thread adapters. 2TM-ESW 2 inch turbine water meter with PVC solvent weld adapters. 49C25 25 ft cable for turbine meters. 49C50 50 ft cable for turbine meters.